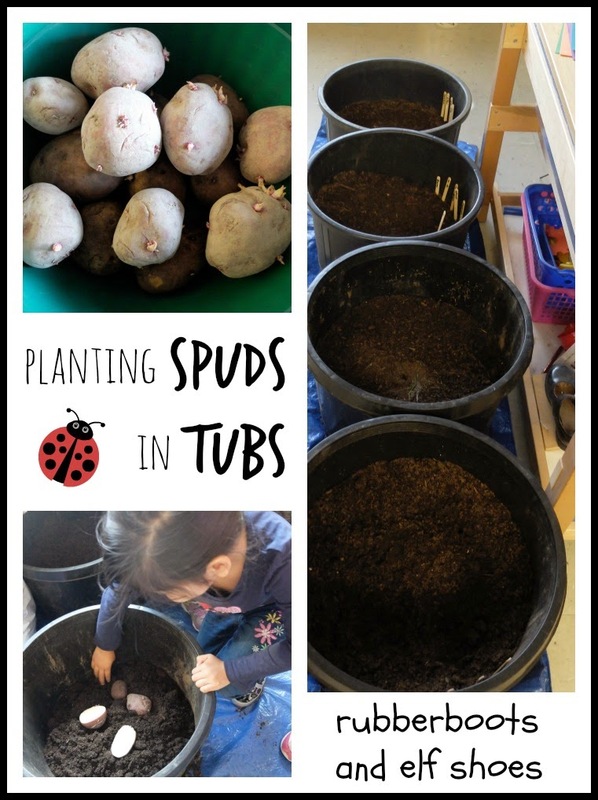 Yesterday our spuds were planted in our tubs. The seed potatoes were all ready. They sat inside a bag in cupboard to warm up and grow some eyes. 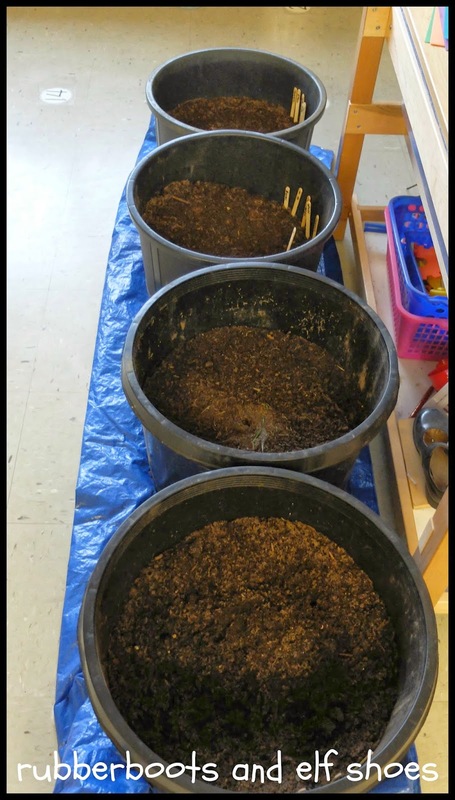 The tubs and soil were ready and waiting. On a tarp. It's always good to keep the janitor happy! 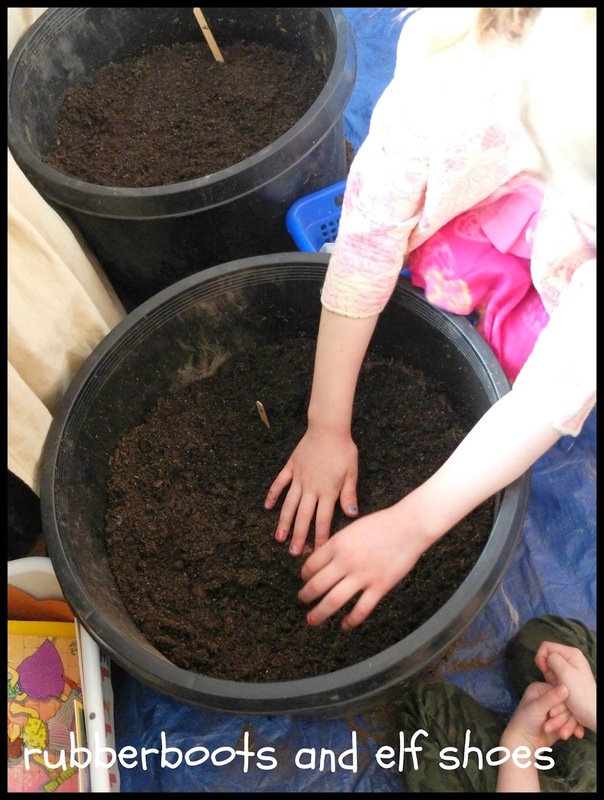 Each child planted a seed potato, being very careful not to knock off any of the eyes. 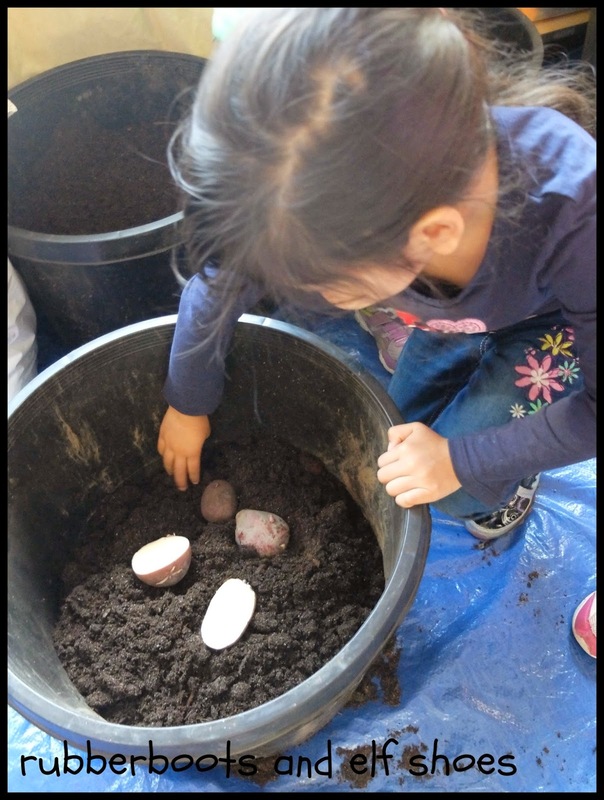 The seed potatoes were gently covered with soil. 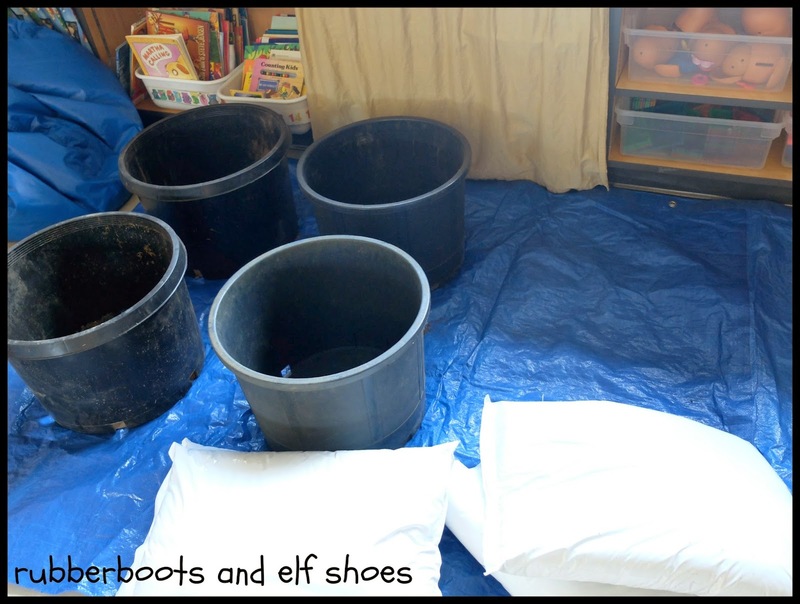 We will keep the tubs inside for a few weeks, watching to see when the potatoes sprout. When the sprouts have a few leaves, we will learn about hilling potatoes. The kids are looking forward to a potato feast at the end of the school year. Hi Sandi...great idea. I've never grown potatoes so I'm keen to give it a go. Lol about keeping the cleaner happy. We do that too! It's always important to stay on the good side of your janitor!! It's our first time growing potatoes in tubs. I have had excellent reports from others who have done it, so I figured we should give it a go. What a fun idea! Bet the kids were super stoked! The kids enjoyed planting - and they are already thinking of eating!! I would love to do this as well. 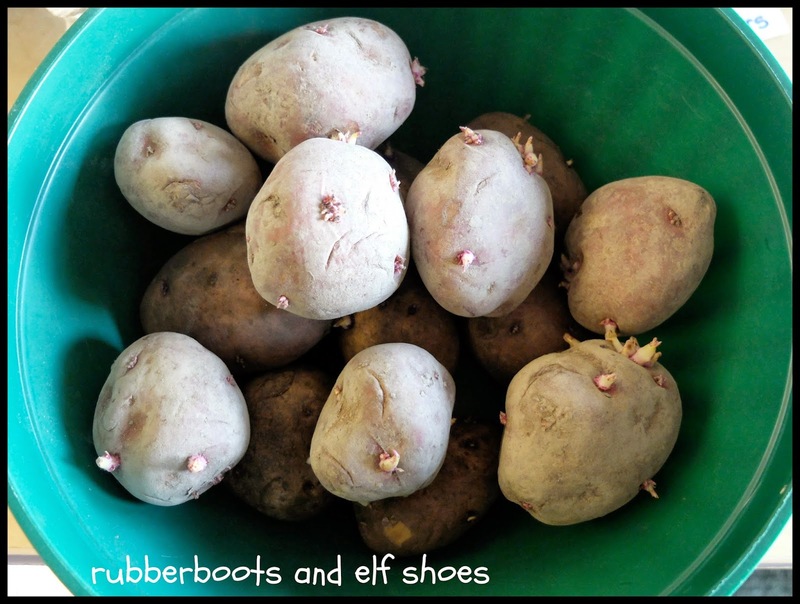 In Maine potatoes are big business so many of my kids know about how they grow, but I always like to do a growing activity and this one looks right up my alley (simple!). It seems to be a pretty manageable project. It would be perfect for kids living in potato country. It seems like a lot of fun and discovery (and food) for a reasonable amount of preparation and effort. Just right for a mum of 6! I just saw the first tiny shoot when I was leaving school on Friday. The kids will be pretty excited on Monday morning. hmmm maybe I shouldn't throw those old potatoes out? Or would those not work? Anyway, thanks for linking up at the Saturday Science Blog Hop & Link Up! I hope you stop by and share again this week! What a great idea. Potatoes in a container? I love it! I can't wait to read how it works out for you. What a fun project! We haven't grown potatoes yet, so I'm really excited to follow along for more tips. Thanks so much for sharing in the Discover & Explore linky. I'm featuring this post today. I've been growing potatoes with my students for years and it is always a huge hit. We've grown them in an old aquarium and in garbage cans. The aquarium is great because the students can see the little potatoes forming. Once the potatoes are grown we make potato soup, a recipe I got from my grandmother. Peanuts are fun to grow as well.